Hammer-IMS supports its extended reach in fabrics and nonwovens markets by playing an active role on events in Rome, Chemnitz and Cannes. 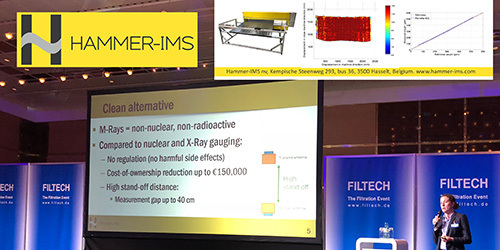 Using a tabletop, a paper presentation and an expo booth, Hammer-IMS will spread the word about its clean M-Ray technology for inline basis-weight measurement of fabrics and nonwovens. Hammer-IMS will take part in the tabletop exhibition throughout the entire conference in Rome (May 23-24). The global audience will have the opportunity to find out more about the non-nuclear and non-radioactive M-Ray measurement technology and inline Marveloc 602 measurement systems (CURTAIN and CUBE). Come and visit us on the Hammer-IMS booth on the mtex+ trade fair in Chemnitz (May 29-31 – booth D1). The fair focuses on technical textiles in a variety of aspects including intelligent and smart textiles, new materials and technologies, technical fibers, yarns and polymers, knitted and crocheted fabrics, nonwovens, finishing and coating, production engineering and process development. 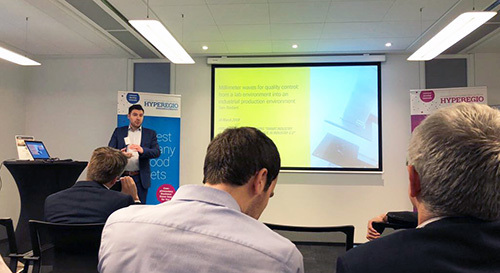 The presentation Hammer-IMS will bring forward is named: ‘High-coverage and clean basis-weight measurement of thick nonwovens and coated textiles’. The presentation introduces the clean M-Ray measurement technology and highlights various aspects of the inline systems related to basis-weight measurement of technical textiles. Hammer-IMS will be present on NHPA to give a technical lecture on its M-Ray measurement technology for nonwovens basis-weight. This fits into NHPA's mission to inform delegates about the latest technical developments and opportunities related to technical nonwovens in high-performance applications. In March, Hammer-IMS has presented papers on AMI Breathable Films (Cologne), Filtech (Cologne) and Duisburger Extrusionstagung (Duisburg).